Discuss Your picks for the most memorable dishes of the year? 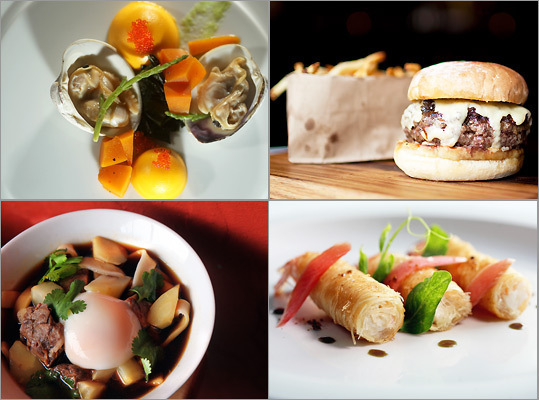 In 2010, poutine and Scotch eggs colonized Boston menus. Hamburgers went high-end, and hot dogs went off the deep end, topped with kimchi or wrapped in bacon and deep-fried. Chefs Jasper White and Lydia Shire reunited to open Towne, and Barbara Lynch aimed haute with Menton. Good food was just as likely to be found at arrivals like the midpriced Bergamot, the Brookline outpost of Sichuan Gourmet, or on wheels — this was the year the city got behind food trucks. From upscale restaurants to simple sandwich spots, there were dishes that stood out — for the thought that went into composing them, for the perfect combinations of flavor and texture, for the single-syllable appreciation that first bite elicited. Wow. Yum. Unprintable. Here are some of the most memorable.